I often talk about how you need to be everywhere and not restrict your product to a market. We all know how annoying it is when we hear about something on Twitter, but are then not allowed to buy it because we live in the wrong country. The internet is global by default, and 'local' is no longer a country or a geographic area. Local is your dedicated fans compared to people who are just mildly interested. If you want to launch a product for a limited audience, you don't limit it to a country, you limit it to your dedicated fans first, and everyone else second. But sometimes I do understand why companies don't want to play in the global world. It's a nightmare. Each country that you have to deal with believes that it should make their own rules and get a cut of your profit. I don't mind paying taxes. But I do mind paying taxes to a country that I have nothing to do with. First you have to go through the grueling process of writing the book. This takes many, many months, part of which requires you to go mad for at least one of these months. You then have to spend a couple of weeks in ebook hell, as you try to convert your cleverly made book containing video, links, and interactivity to a format that can be read on the Kindle (which BTW you can't). Then you have to spend 10 minutes uploading your ebook file to Amazon, type in the title, description, and set your price. It is very easy to do! (far easier than submitting something to Apple). Within 24 hours, Amazon will do a quick check of your book and put it up for sale in their store, for which they take a 30% cut of whatever price you set. This sounds like a pretty good deal. You earn 70%, which is about a billion times more than what you would get from a traditional publisher (although I might be exaggerating just a bit). 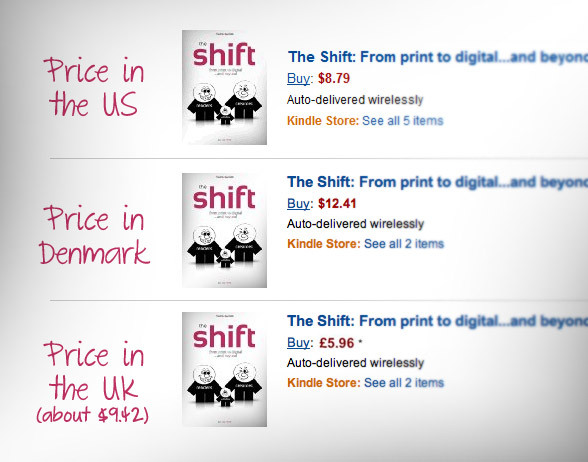 Take my book, "The Shift. From Print To Digital...and Beyond!" When I published this book on Amazon, I decided to set a really good price of $8.79, meaning I would earn about $6 per book sold. Sounds good, right? First is the problem of sales tax. In the US, my book is indeed priced at $8.79, but if you are from Denmark, Amazon is required to add Danish sales tax - which is a staggering 25%. The result is that the same book is suddenly $12.41. For those of you who are good at math, you will quickly realize that comparing $12.41 to $8.79 is not actually an increase of 25% - it is an increase of 41%. I asked Amazon, "WTH are you doing that for?" and they only answer they gave me was that it is because of fees in relation to EU. So here I am. I live in Denmark and I'm a Danish citizen, but while I can sell my books to my followers in the US for $8.79, my neighbor has to pay 41% extra, just because I am selling my book from a server in the US. The sales tax doesn't actually change how much I make, but it has a serious effect on how many people who are willing to buy my books. My book sale in Europe is about 5% of what it is in the US. But it doesn't stop here. Yesterday, I received a letter from Amazon with the title, "Foreign Person's U.S. Source Income Subject to Withholding." It stated that Amazon had withheld 30% of my profit as US income Tax. 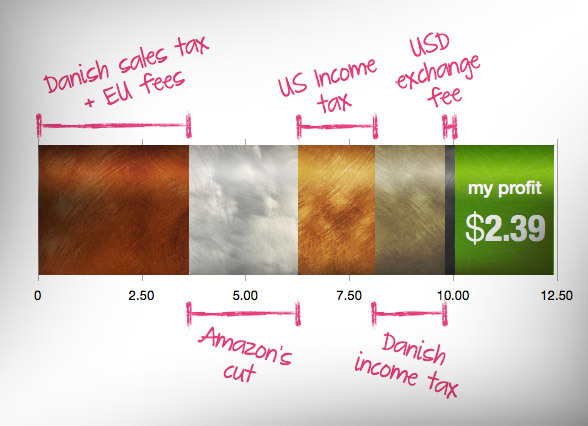 Don't forget that I am also paying Danish Income tax, so basically I'm now being double taxed. On top of all this, Amazon is paying me via a check in USD, which I have to cash manually in my local bank while paying a steep fee for exchanging US dollars into Danish Kroner. Of the $12.41 that my neighbor has to pay, I only get $2.39. The world's Governments get 58%, my bank get's 0.2%, and Amazon gets the rest. Why did I publish my books on Amazon again? I'm not making any money from it. It just goes to everyone else! As I started out saying, I don't mind paying taxes. But I do mind being punish so severely for trying to play nice in a global world. Why am I paying 41% in sales tax, when the Danish sales tax is only 25%? Why should I pay income taxes in two different countries, when I only live in one? Arguably, I could try to apply for a US Tax Identification Number - a TIN, which is actually an EIN. This involves a lot of complicated forms and sending them what they call a wet-ink mail. I have no idea what a wet-ink mail is. Not only do I not own a printer, but all the printers I did own in the past outputted paper with the ink already dried. Maybe it's some kind of bureaucratic process that involves soaking the form in a bucket of water before sending it. But even so, this would only exempt me from paying US income tax (maybe), it would not change anything about the abnormally high sales tax. Again, the only reason for this insanity is that Amazon is a US company. Another and much better solution seems to be to sell my books directly, using a EU payment provider. I looked into this and here is the result. 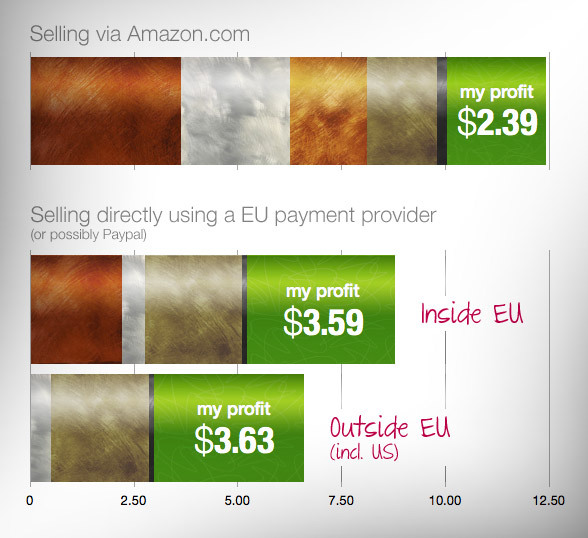 Using Amazon, most of my profit is being eaten up by taxes and fees. Mostly because I am a non-US citizen using a US company to sell to people globally. But if I moved the shop to a EU server (selling direct), using a European payment provider, I would still have to pay sales tax for people in the EU. But while the sales tax using Amazon is 41%, it would only be 25% using a European provider. I would also still have to pay income tax, but only to one country. I can not only reduce my price to the original $8.79 I wanted for my book, but I can also reduce the price substantially for people outside EU - and still make more money. And, I can still sell my books to everyone in the world. The only difference is that the shop is no longer handled by a US company. This whole tax madness is just a way for the Government to punish me for being a Danish citizen doing business in the US. I don't blame Amazon for any of this. They are burdened by this as much as I am. The people we should blame are the world's Governments, who are still living in a disconnected world confined by borders. Each one trying to add their own rules, their own level of bureaucracy, their own import and export fees, and their own taxes. In their eyes, I'm exporting my book to the US, and then importing it back to Europe. In my eyes, I'm selling it to everyone from the internet using a cloud based provider. The result speaks for itself. Instead of having a competitive world where people would thrive, we now live in a never ending financial crisis. A world where people don't have enough money to pay their bills because everything is too expensive to buy. I don't know what I'm going to do about this yet. I might just decide to ignore it. The reason is that I already have a much better solution - my subscription service. When you buy a subscription for Baekdal Plus, not only do you get all my content for $5/month, you also get all my books for free. And on top of that, you are dealing with me directly and that means no Amazon, no fees, and no double taxes. So do me a favor and subscribe to Baekdal Plus. It's much better value for the money - for both of us!